Every week we receive numerous press releases related to transport and we only tend to comment on a few of them. Here are a couple that piqued our interest but not quite enough for a full post of their own. While the first services started using the station on Sunday, Monday saw the official opening of the new Parnell Station. Currently only the Southern Line stops there regularly with the Western Line only stopping in the evenings and on weekends. We’ve talked a lot about the station in previous posts so don’t need to re-litigate that here. As it stands the station is bare bones and AT even warns that it’s not recommended for mobility impaired passengers. I’m personally a little skeptical that the station would see 2,000 people in the morning peak any time soon. As tourism figures continue to rise in Auckland, so do passenger numbers on popular ferry routes. Fullers is introducing a new vessel, Capricornian Surfer (Cap Surfer), dedicated to Devonport. A unique destination, the charming seaside village of Devonport is a bustling visitor hub, but also services more than 1,000 commuters who rely on Fullers ferries daily. Cap Surfer will begin service in the next couple weeks, complementing Kea. Since 1988, Kea has been the favourite vessel of the route with efficient boarding through side doors. Similar to Kea, Cap Surfer has side-door loading and four engines, allowing it to manoeuvre in the same way when docking. This will help keep the Devonport service running to schedule. “We acknowledge some service interruptions on the Devonport run this summer, and want to let our passengers to know that we’re listening. We’ve leased Cap Surfer from Australia specifically for Devonport, freeing up other vessels not always suited to the Devonport route,” said Fullers Chief Executive Douglas Hudson. The $6 million vessel is capable of carrying up to 380 passengers. It’s currently being fitted with a new café and bike racks, after 40 additional seats were installed on the back deck. Cap Surfer is spacious and comfortable, with big windows and air conditioning. The 35-metre EnviroCat uses less fuel per passenger than a small four-cylinder car. Its systems are computerised and fully integrated. Crew training is currently underway, being led by Cap Surfer’s Australian crew while she was servicing the Gladstone to Curtis Island run in Queensland. Designed to navigate shallow waters, Cap Surfer will also be able to service Half Moon Bay on low tides. As Kea closes in on 30 years of service, Fullers is investigating options for her future – while keeping a pulse on rapidly evolving technology, including electric ferries. 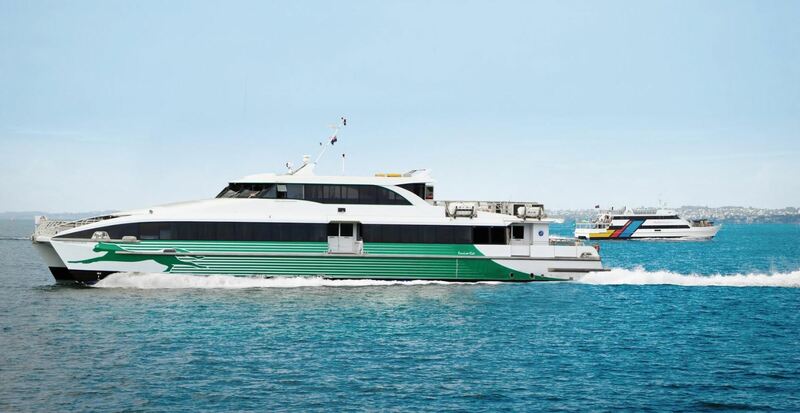 “By leasing a modern ferry for two years, we’re able to evaluate alternative propulsion technology and its suitability for Kea’s eventual replacement. Though Kea is a highly reliable vessel, we need to be looking ahead. Retirement isn’t imminent, but when the time comes, we’ll have a well informed decision on what technology to include in a vessel purpose-built for Devonport,” said Hudson. Auckland Transport is doing its bit to help conserve water. Following silt infiltration of dams in the region, Watercare Services is calling on Aucklanders to reduce water usage by 20 litres per person, per day until the end of March. In response Auckland Transport has asked its maintenance contractors to limit water use and to carry out water blasting only if it is absolutely necessary. “We have scheduled cleaning for facilities such as bus shelters, train stations and platforms but we’ve asked that water blasting only occur for hygiene reasons for the next few weeks,” says Tony McCartney, Group Manager Assets and Maintenance. “We expect that this could save thousands of litres a week. As a result, some facilities may be a little grubby but this is for the greater good of all Aucklanders,” Mr McCartney says. It appears the cabinet is determined to proceed, regardless of evidence which ought it give it reason to pause. Transport Minister Simon Bridges responded to calls to scrap the project by arguing that the four-lane highway was a “game changer” , economically and socially. He pointed out the road, which could shave seven minutes off the journey between Wellsford and Warkworth, was incredibly popular in Northland. Roads, in particular links which could cost as much as $2b, should not be constructed on the basis of popularity. That is not a reassuring sign for completing the project, in time and within budget. There used to be quite a bit of room at Parnell, I can remember not so long ago when the old sheds were used for the heritage steam trains. A quick check of aerial photos shows the train lines are hard up against the domain where they used to be. Kiwirail selling the land does seem to contradict the idea of the old ARC buying the rail track assets back in 2000? Very popular in Northland says Bridges. Anything to try to dislodge Winston – one way bridges transformed, now $2billion(!!) on an uneconomic road. And the Nats claim to be fiscally prudent. Still, plus ca change and all that – Aucklanders have been subsidising South Island roads in National electorates for decades. Which are these South Island roads that have had an excessive amount of money spent on them? I haven’t come across them myself. Every road in Westland for a start. All the internet kit installed on the long, well maintained and lightly used roads of Bill English’s old Southland electorate is tip top brand new as well. The Clutha and Southland Districts were two of the biggest losers from changes made by National to the NLTF to free up funding for RONS, I’m not sure they have benefited much from having English or National in power. Westland has historically been a Labour stronghold so I’m not sure Harry’s logic stands up even if this is the case. I can’t think of any road in Westland that is over-engineered, unless you are thinking that the two lane SH6 from Hokitika to Hawea is over-engineered. This road is a core plank of our tourist industry, and it’s worth remembering highways are funded by fuel tax not general tax, which means tourists who are not even part of the population, will contribute a significant amount of funding to this road. I’m not sure I’d call money that goes to maintain those roads that comes from tourists contributing fuel tax to the NLTF a subsidy. The Crown Range is an oddity it was a state highway up till 1990 even though it was gravel and not heavily used, now it is sealed and is the main route from Queenstown to Wanaka it is a local road. Glad to see Parnell open, but a couple of questions: 1) This project was massively delayed and there was little to no information on the Council websites as to why; and 2) while I appreciate the running patterns are temporary, I’m not sure who is served by a station that serves different lines depending on which peak it is. A train I can catch home from work in Parnell isn’t much help if I have to drive to work in the morning to begin with. I’m looking forward to this being fully operational. I thought the service patterns were the same during both peaks, am I incorrect? Eitherway, some people travel in during peak and out during non-peak. Visa versa. Plus people like having flexibility, or the option of flexibility. Especially somewhere like Parnell where hospitality options are amazing. Not saying that it was possible to service these, but at the same time its a valid point and will stop a lot of people using the service. As it has been proven, having regular services, even if people are not using them, can be the difference for people using the service at all. Also if they are advertising this stop for the University then providing regular all day service is extremely important, students travel patterns vary a lot between peak and non-peak. Although at the same time I’m not convinced Parnell will be a massive student used station as AT are wanting, Britomart in my view will still rein supreme here. Western line only stops in weekends and nights, is this where you are coming from? Southern is the all day/7 days service one (transfer at Newmarket if so…esp in peak should be OK – apart from when disruptions! – and you have to wait with a Western to turn around at Newmarket anyway). Having thought about it a bit it does free me from the bus ride up Parnell Rise and into Newmarket which is usually painful, but that’s a modest improvement. Serious question. 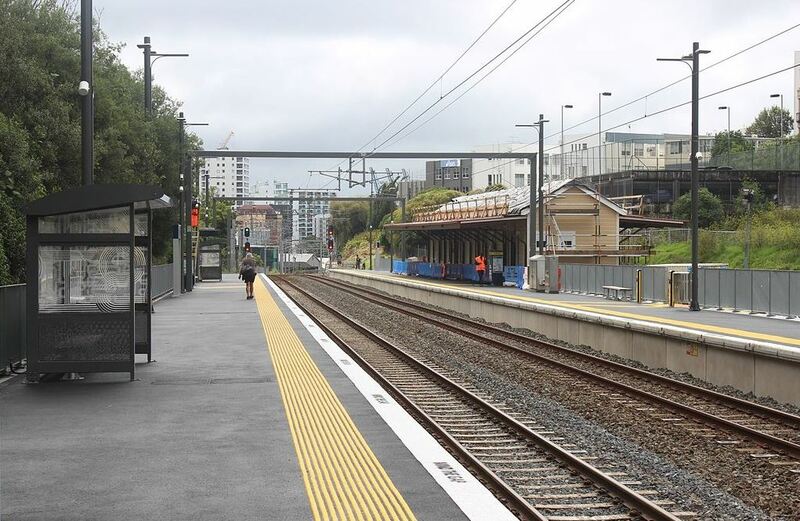 What are the benefits of installing a station building at Parnell before a bridge between platforms? Could the building not have waited for further funding rather than the bridge? Is the building open to be used? Toilets/waiting space etc? It is my understanding the Parnell station was a pet project pushed through AT by Councillor Mike Lee at the expense of Pukekohe Station upgrade being delayed. Pukekohe upgrade is now underway…. Phil Goff has seen the flaw in having Councillors on the Board of AT so they have never been reappointed. And AT does not have to deal with Director’s pet projects. Parnell Station is very disappointing. Access to the station is very hard and limited. Not very inviting at all. I used Parnell Station yesterday to get to work, yes I got to work faster than I would getting off at Newmarket and walking across into Parnell but the time saved didn’t outweigh having to walk up what is a pretty steep incline to get up onto Cheshire Street. I unfortunately choose to continue down and go up Tika St which was even more steep rather than Akaroa St which seems a much gentler and gets you onto Parnell Rd faster. Still plenty of work to do there. Question: How do you add the Parnell station to show on Google maps (directions work with it but it’s not a station you can see as such like the others)? Map editor perhaps as “add a missing place” is only for business and the like it seems (can’t find category for “train station”). Anyway thought that would help raise it’s profile. Also am I correct it won’t be used for getting to special events like ANZAC day service & Lantern Festival? This is understandable but disappointing as 700+ people unloading and trying to tromp up the bush steps and path to the Domain would be a no go I guess without an upgrade. Seems to the Auckland University Library point it is the about the same time on journey planners (to about a minute) from a southern train to get off there and walk with current paths, than it is get off at Britomart & catch a bus up Symonds St. Would be nice nature walk for some but then nightmare crossing on Stanley St, also not very safe (or feel safe) bush walk by yourself esp. at night I would suspect. You can’t. Transport features are governed by AT-Google liaison. I suspect it will show up in the next few weeks. Will this new ferry actually add frequency to the Devonport run normally or just when weekend overload or breakdowns etc? How is Parnell station going to be effectively gated when it is such an open platform? Is it going to be staffed at all? As I understand stage two is going to add a bit of new design features, also open gated stations appear to work overseas effectively so don’t see an issue. Eitherway from fare recovery it surely better than just tag on and tag off posts.